First, remove the collet by pulling it out with your fingers. No special tools required. 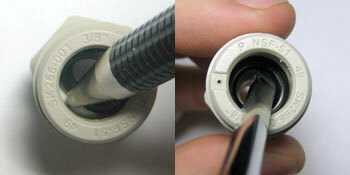 Next, with a thin-bladed tool, like a small screwdriver or toothpick, reach in and pull the o-ring out of its well. To replace the o-ring: reverse the procedure, tamp it into place with the end of a piece of tubing, then push the collet back into place. It's rare to have a major leak in a quick connect fitting, but as fittings age, o-rings deteriorate and small drips sometimes develop. Certain chemicals in water, particularly chloramines, can erode o-rings and cause leaks. Leaks also can result from improper installation in which a tube is pulled sharply to one side. This stress flattens the o-ring over time and causes a leak to develop. 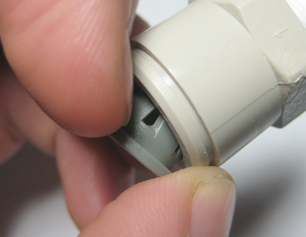 If a quick connect fitting leaks, there is usually no reason to replace the entire fitting. Replacing the o-ring is easier and less expensive. You don't have to remove the fitting from the unit to replace the O-ring. 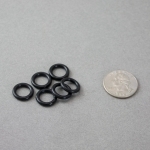 We stock the common sizes — 1/4" and 3/8" — of O-rings, collets, and locking clips. The rings are Mur-lok brand, but they interchange with John Guest fittings and, we suppose though we don't promise, other brands of quick connect fittings as well. We also have collets in the same sizes. 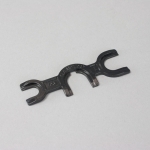 It usually isn't necessary to change collets when O-rings are changed, but if you want them, we have them. 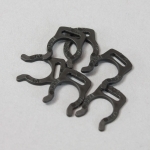 As for locking clips, we've seen no evidence that they make fittings any safer, and we don't use them ourselves, but if you want them, here they are. We even have a Mur-lok release tool (which works on John Guest as well), although you don't really need it in most cases. We've found it handy for fittings in hard to reach places, like faucet stems. 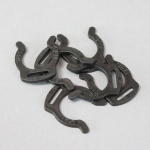 Standard O-rings are made of EPDM rubber. This is what you normally get when you purchase a new fitting. 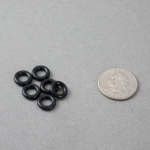 The Mur-lok EPDM O-rings below are an NSF/ANSI Certified Component. Replacement o-rings are sold in six packs. Please, don't call and ask us to sell you a single o-ring. Remember that a six pack of O-rings will allow you to fix six leaky John Guest fittings but only three leaky Mur-Loks. That's because Mur-Loks have two O-Rings. You usually don't need to replace the collet to fix a leak, but we have them in case you want to replace them. We don't use the locking clips ourselves, but we've got them if you're committed to safe plumbing. The Mur-Lok release tool is usually unnecessary, but if you have a stubborn fitting in a hard-to-reach place, you'll be glad you have one. At left, a transparent Mur-lok, showing the position of the white collet and the black O-rings. Mur-lok fittings have two O-rings. John Guest fittings have one. 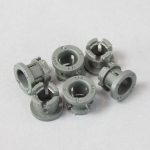 If you don't want to fix a fitting but to replace it entirely, Quick Connect Fittings are sold on our fittings page and our RO Parts page. A six pack of collets for 1/4" John Guest and Mur-lok fittings. A six pack of collets for 3/8" John Guest and Mur-lok fittings. A six pack of o-rings for 1/4" John Guest and Mur-lok fittings. A six pack of o-rings for 3/8" John Guest and Mur-lok fittings. A six pack of locking clips for 1/4" John Guest and Mur-lok fittings. A six pack of locking clips for 3/8" John Guest and Mur-lok fittings. 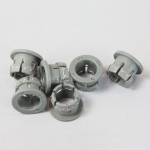 For easy release of all Quick Connect Fittings. Fits 1/4", 3/8", 5/16", and 1/2" Fittings.